Taylor's & Company is dedicated to producing historically accurate replicas of firearms designed between the mid nineteenth century through the beginning of the twentieth century. As an importer, quality control is taken very seriously and every firearm is inspected before it leaves the facility. I am a huge fan of these single action revolver and Taylor's was kind enough to send a Short Stroke Smoke Wagon out for testing & evaluation. The model requested for review (Item Number 556202) features a five and a half inch (5.5") barrel and is chambered in .45 Long Colt. The Smoke Wagon line of revolvers is likely named after a line in the film Tombstone (1993). During an argument, Wyatt Earp (Kurt Russel) challenges Johnny Taylor (Billy Bob Thorton) to draw his revolver referring to it as a smoke wagon. These models have a deep blued finish with a case-hardened frame. This firearm also comes with a short stroke action and a low profile hammer spur for faster manipulation. Rather than selecting traditional smooth side stock, the Smoke Wagon's stocks feature deep checkering that provides a bit more control and comfort during use. The rear sight notch has been widened to allows for a better sight picture. While none of these updates are period correct, they improve the handling of a classic design. What is a "Short Stroke" action? 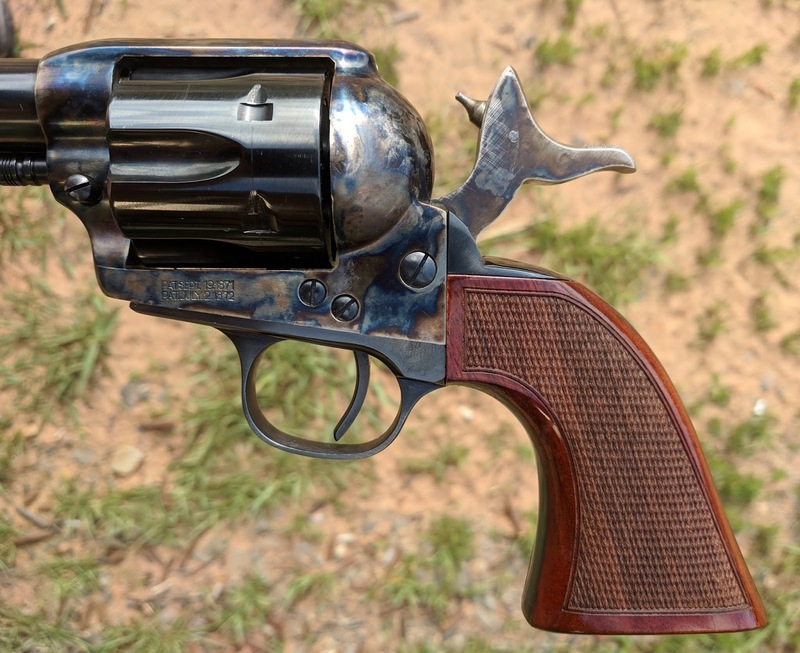 For those unfamiliar with the single action design, the Smoke Wagon's hammer must be cocked by the shooter for each shot. 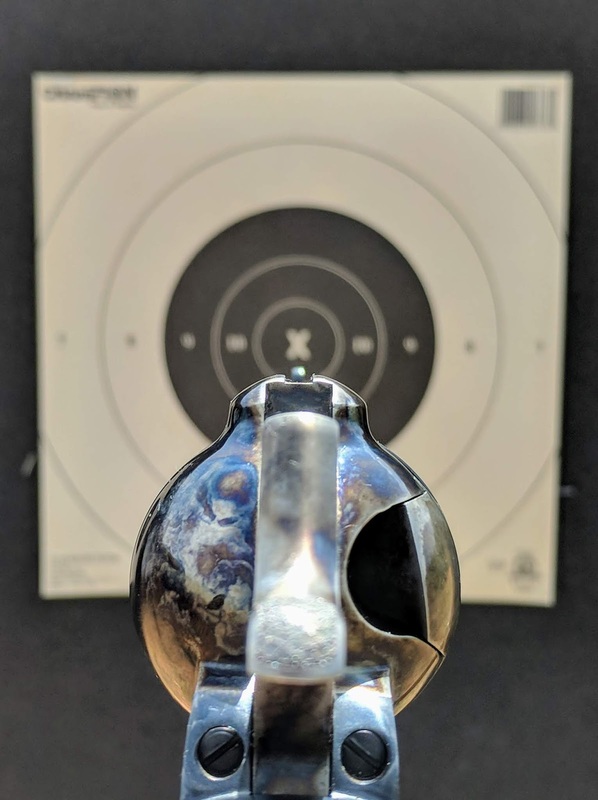 In many revolvers with this type of action, the throw of the hammer is relatively long. While a normal hammer can be cocked quickly, anytime saved in the shooting process is beneficial whether on the range or in a showdown at high noon (even if this sort of thing never happened in the Old West). This is the reason that Taylor's selected this enhanced action. As a bonus, shooters with larger hands who suffer from hammer bite will enjoy this improved design. The photo above is a comparison between the standard length action and a short stroke action. There is a clear difference between the two action types. With a little tinkering, gunsmiths shortened the hammer's length of travel while maintaining reliable ignition. Short stroking actions has become popular in cowboy action shooting to shave time off the clock. Milliseconds matter. I plan to shoot a few cowboy action matches in the next year or two and I see the appeal of the short stroke hammer. I'm glad Taylor's chose to include this type of action on the Smoke Wagon. Most revolvers manufactured in the single action army pattern are equipped with smooth wooden stocks. 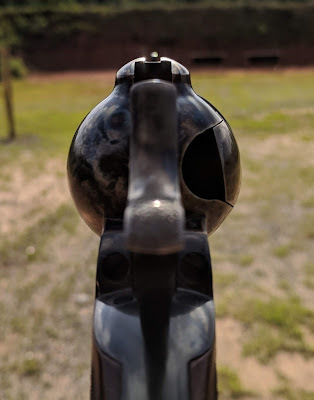 I've found that the smooth stocks are a bit too slick when shooting heavier recoiling ammunition. I recently discovered that replacing stocks on the single action frame is a labor of love and often requires refinishing the frame. The Smoke Wagon ships with checkered wooden stocks, which provides more traction during recoil. This upgrade makes this revolver just a bit better than some of the Taylor's other offerings. There is just enough texture to maintain a good grip without being uncomfortable. The original single action army was designed with a very utilitarian sighting system. This is basically a tall front blade and a thin rear notch at the back of a trench milled into the top strap. For someone spoiled with fiber optic front sights, or red dot optics for that matter, shooting with these rudimentary sights is challenging. As my readers know, I am one of these shooters who has had access to these modern sighting systems. Red dot sights ride on many of my revolvers and almost all my handguns have fiber optics front sights installed. Taylor's & Company manufactures the majority of their replicas to the original specifications. Despite the temptation to make changes to the design, the company focuses on historical accuracy. 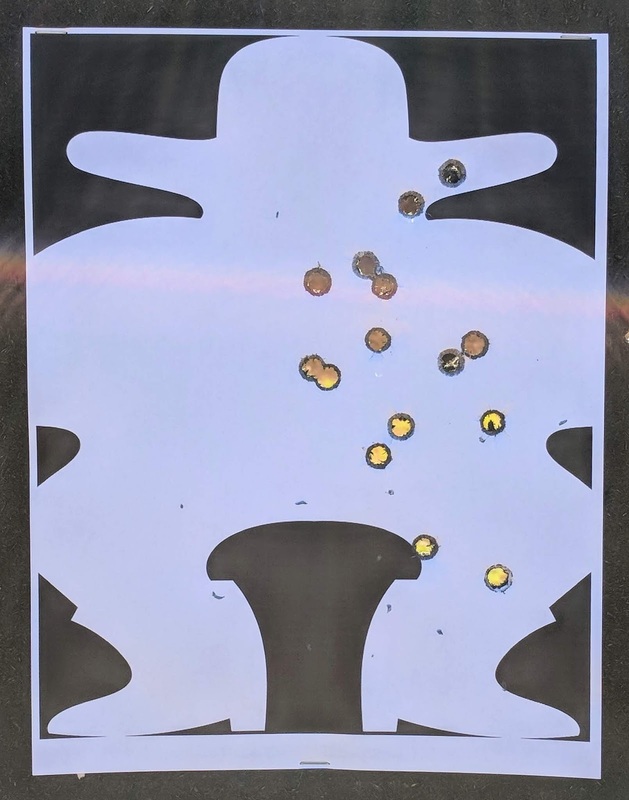 The decision to widen the rear sight notch slightly on this improved model should appeal to both competitive shooters and fans of the single action design. This is a clever upgrade that further enhances the shooting experience. For testing purposes, I purchased three different brands of ammunition to run through the Smoke Wagon. The first round was manufactured by Aguila Ammo (Item Number 1E454319). This is a 200 grain lead round nose flat point bullet going about 600 feet per second. The second round was made by The Buffalo Cartridge Company (SKU: BCC00017). While it is also 200 grain lead round nose flat point bullet, the velocity is a bit faster at 685 feet per second. The final round selected was Hornady Cowboy (Item Number 9115) and propels a 255 grain lead round nose flat point bullet 725 feet per second. I wanted to shoot a decent variety factory ammunition through the Smoke Wagon to test for reliability as well as shooting experience. Five rounds of each on a cowboy silhouette. I really enjoyed shooting this replica of a historical firearm! 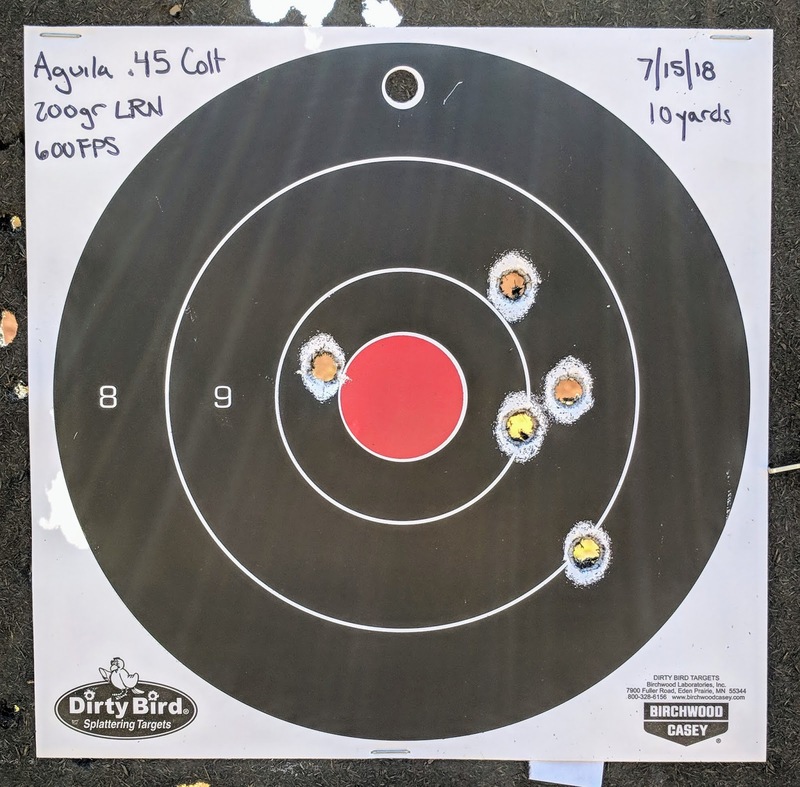 While I do have a bit of experience with single action guns like the Ruger Bisley and my single action army, the majority of my revolver shooting experience is with modern Smith & Wesson wheel guns in double action. The grip frame design is a bit short, but still comfortable even if my pinky finger hangs off the bottom. Due to the shape, the Smoke Wagon rolls in your hand during recoil. This is different than what I'm used to, but Colt was on the right track when this frame shape was designed. 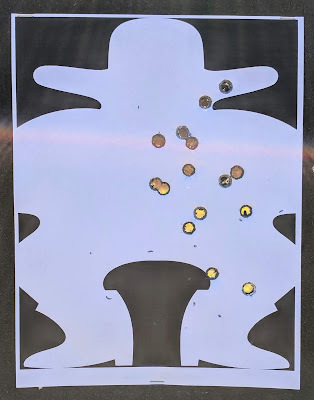 Here are some of the targets showing the results of my ammunition testing! The first rounds loaded into the cylinder were the Aguila Ammo "Cowboy Action Load." Full disclosure, this is actually the round I keep on hand for use in my single action army manufactured by another Italian firm. The lead bullet is loaded into Starline brass, but I don't recognize the primer. My previous experience with this ammunition lead me to believe it would be the lightest recoiling round of the bunch. This ammo is something that you can shoot all day through the Smoke Wagon and I ended up shooting two boxes during the testing process. 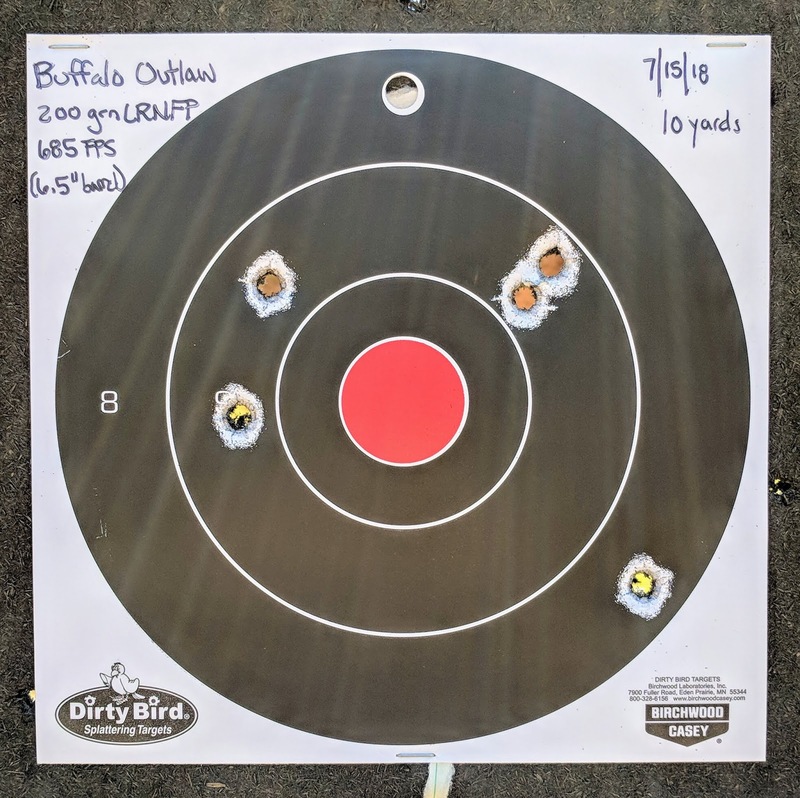 The Buffalo Cartridge Company produces a product line designed for cowboy action shooting called "Outlaw." 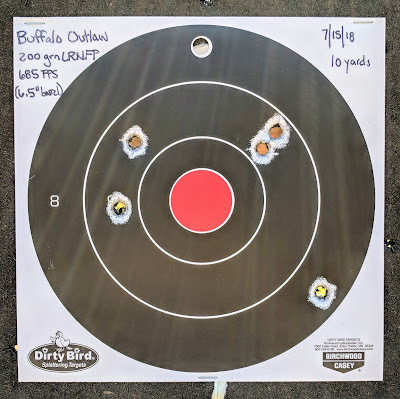 Buffalo is affiliated with the Single Action Shooting Society (SASS) as of 2017, so I figured what better round to test in a revolver ideal for cowboy action shooting! Buffalo claims to use only "high grade components" and I believe it. Presentation matters as much as performance to some shooters and this ammunition receives top marks in both categories. These rounds look very pretty out of the box. While recoil is slightly higher than the Aguila Ammo, this ammo loaded lightly enough that you should be able to shoot an entire match without issue. I'll be picking up a case when I need to restock! 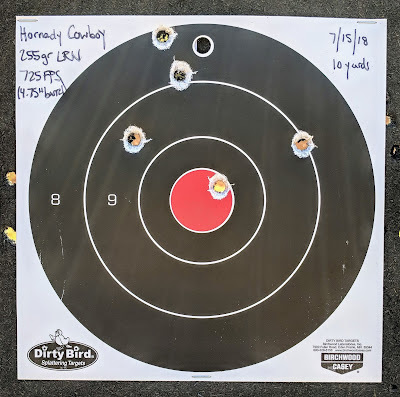 The Hornady round tested was also marketed as a lighter cowboy load. Compared to the other two rounds, this recoiled the hardest of the three. It actually surprised me after firing two very mild offerings back to back. All that being said, Hornady Cowboy was still very was manageable. The higher velocity bullet resulted in the projectile striking slightly higher on the target. I didn't save any of the targets I shot at the 25 yard mark, but the bullets were impacting closer to the center at that range. All told, I fired 190 rounds through this wheel gun and enjoyed every minute! My parent's generation grew up watching westerns. I didn't. Instead, one of my first encounters with the single action army revolver was in the video game franchise Metal Gear Solid on the Sony PlayStation. A key character named Revolver Ocelot wields a pair of single actions, often spinning them in dramatic fashion, in several of the games. Ever since this gaming experience I've wanted to own a similar model. 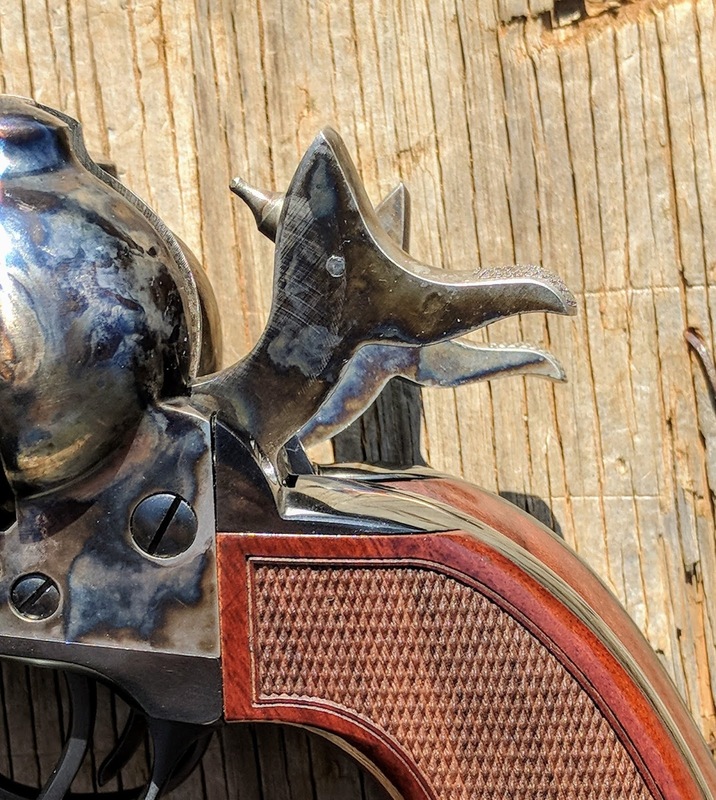 There is another variation of the Short Stroke Smoke Wagon, known as the Short Stroke Gunfighter, that features an extended grip frame and similarly checkered wooden stocks. I hope to test this model and it's unique grip in the future as well. Special thanks to Ashley of Taylor's & Co. and Steve of Evatt Marketing Group for making this review a reality. Please visit the Taylor's & Company website to view all of their product offerings. I hope to review a more models from Taylor's large catalog of firearms soon!